You’ve probably heard a lot about the health benefits of drinking tea, especially the benefits of green tea, considered by many to be the ultimate “anti-aging beverage.” In Okinawa, Japan — one of the world’s “Blue Zones” that’s associated with longevity —drinking green tea daily is considered “essential.” A popular practice is sipping on a combination of steeped green tea leaves, jasmine flowers and a bit of turmeric throughout the day. According to a report published in the Journal of the American College of Nutrition, “Tea is the most consumed drink in the world after water.” What is green tea good for? According to dozens of studies, regularly drinking green tea may reduce your risk of developing heart disease or Alzheimer’s, help you maintain better bone mineral density, ward off eye diseases that affect vision in older age, prevent strokes, and even extend your life. A great deal of evidence from randomized controlled trials suggests that consumption of flavan-3-ols and anthocyanidin antioxidants, the types found in green tea, is beneficial for metabolic and cardiovascular health. When it comes to preventing many of the risk factors for heart disease, such as having high blood pressure or cholesterol levels, some evidence shows that green tea contains 10 beta-blocking compounds, seven calcium channel blockers and 16 diuretic compounds. It also has more ACE-inhibiting properties than many other plant foods that are commonly consumed, which helps increase the amount of blood your heart pumps and lowers blood pressure. According to a study published in the journal Chinese Medicine, many of the beneficial biological effects of flavonoids on heart health seem to be due to cell-signaling effects that lower inflammation. Not only do flavonoids have anti-inflammatory capabilities, but they’re also antithrombogenic, antidiabetic, anticancer and neuroprotective compounds. In 2004, scientists at the University of Newcastle studied the effects of black and green tea on Alzheimer’s disease. In laboratory studies, both teas prevented the breakdown of acetylcholine, the neurotransmitter strongly linked with memory. The teas also inhibited enzymes known as BuChE and beta-secretase. These enzymes are found in protein deposits found in the brain of Alzheimer’s patients. 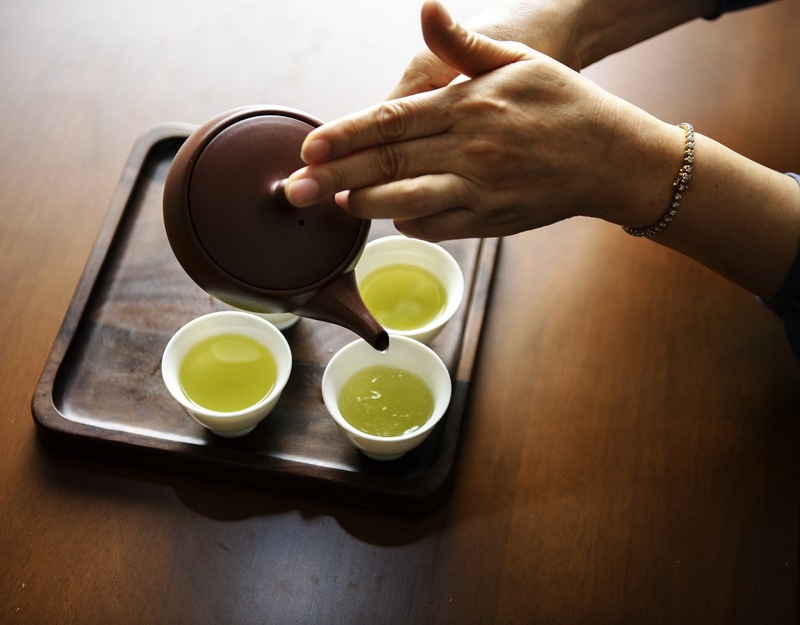 Japanese researchers published a study on green tea and its effect on the beta-amyloid protein plaques found in Alzheimer’s disease in the April 2008 issue of the Journal of Nutritional Biochemistry. The protein plaques associated with Alzheimer’s disease increase brain cell damage and death due to oxidative stress. The researchers found that green tea catechins reduced the level of damaging free radicals in the brains of rats. The green tea rodents showed much less plaque-induced deficits in memory compared to rodents that didn’t receive green tea and those that were infused with beta-amyloid proteins. In 2007, Salk Institute researchers found that the flavonoid epicatechin, found in blueberries, cocoa, grapes and tea, improved memory ability in mice. The researchers found that epicatechin seemed to promote blood vessel growth in the brain. University of Hong Kong researchers published a study in the August, 2009 Journal of Agricultural and Food Chemistry concerning green tea and bone health. When the bone cells of rats were exposed to green tea catechins, EGC in particular stimulated an enzyme that promotes bone growth by 79 percent. The catechins also increased bone mineralization and weakened the activity of cells that reabsorb bone rather than form it. One study that was published in the February 2010 issue of the Journal of Agricultural and Food Chemistry investigated the effects of catechins on eye diseases and found that consuming more catechins may help protect the eyes from oxidative damage and vision loss. Scientists involved in the study found evidence that catechins can pass from the digestive tract of rodents to the tissues of their eyes and reduce oxidative stress for up to 20 hours after ingestion. Overall, EGCG’s effects remain somewhat controversial; some studies have found only modest effects on metabolism, while others have found that consuming more EGCG alone without other lifestyle changes does not do anything significant to improve body weight. Most experts recommend drinking about three to four cups per day for the most anti-aging benefits of green tea, but even drinking one to two cups is a step in the right direction. Place your tea bag or high-quality tea leaves (purchase organic from a reputable company for the best tea) in your teapot. Once brewed, pour a little tea at a time into each cup in order to have the tea’s strength be evenly distributed. At this point, you can add some lemon juice or raw honey as the finishing touch. Fill kettle with fresh, filtered water and heat to just short of boiling. Fill matcha bowl or cup with hot water and pour out (to warm the bowl/cup). Add 1 teaspoon of matcha powder to bowl or cup and 2 ounces of nearly boiled water. Whisk for a minute or two until it looks thick and frothy with tiny bubble, then add 3–4 more ounces of water before drinking. From the 3rd century through the 6th century, green tea was mostly considered a “luxury item” before new techniques for drying and distributing green tea led to more mass production and availability among the public. According to the Teavivre, a tea company, during the time of the Song Dynasty in China (AD 960–1279), “tea drinking had become an integral part of the daily life of all Chinese, in a similar way to how afternoon tea became ingrained in the English culture. The use and production of so-called ‘tribute teas’ — those produced to be presented to the emperor and other high officials — became an important part of royal culture and a source of government taxation. Green tea comes from the Camellia sinensis plant and consists of leaves that haven’t been fermented, allowing them to retain high levels of antioxidants. Some of the anti-aging effects and benefits of green tea include reduced inflammation, protection against heart disease, liver disease, diabetes and Alzheimer’s, and potentially help with weight maintenance and preventing cancer.